Congratulations to the following WMR winners who SWEPT the awards in different age divisions. Chris running full speed on mile 5 towards the finishing line. Larry and Rosa before the race. Chris and Larry get caught by the Military Police cutting the race course. Rosa " Superwoman" Arevalo trains with the Morning Crew! When Rosa hit her goal to qualify for 2006 Boston Marathon last December, she has been more dedicated to train with the *Morning Crew* (MC) runners. While most women like to get their beauty sleep, Rosa along with bunch of WMR men are already cracking steady pace for 8 to 10 miles 5:00 am in the morning. *A lot of people thought we were nuts, rising up every day at 4:15 am to run in the cold and dark. But believe it or not, the parking lot is half full at times. The only challenge is to watch out for those little skunks*. said Coach Ismael Favela who leads the *MC* runners. Rosa was awarded Most Improved Runner and Best Contribution 2005. She has exemplified the qualities of running sportsmanship, loyalty and commitment to the club. She continued to improve throughout the winter season, from running near Julio early on last year on to Boston qualified runner. *Its not easy getting up early in the morning. Having a full time job and implementing earlier bedtime is hard. But dedication and discipline lead to running success* said Rosa. 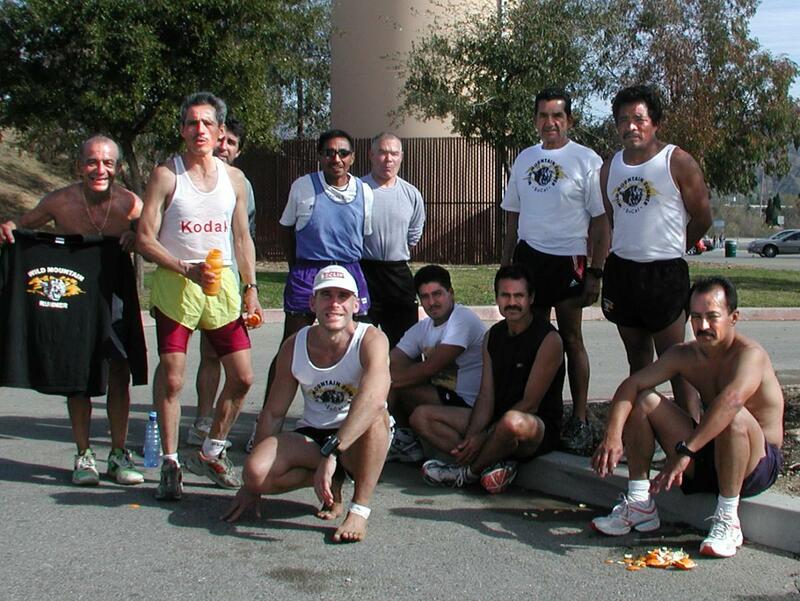 Also, *training in a group has helped me motivate better running performance in many areas. Chris in particular has become a good role model for me*. 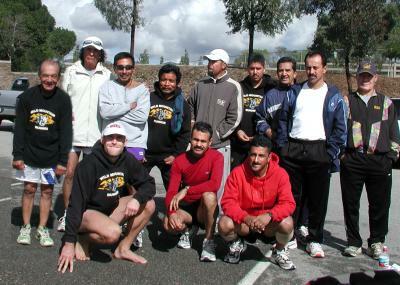 Over the years, the Wild Mountain Runners *MC* have been consistent with their training in Griffith Park. The training schedule worked up to about 60-70 miles per week which includes a long 18-22 Saturday milers. The Thursday speed workouts involved running 400s, 800s, and mile intervals, which were conducted at about 5k race pace or faster. Coach Roberto *Kadafi* Perez conducts speed and strength workouts for the WMRs on Thursdays. All bundled up in layers, and still suffer from the cold, the *MC* runners will train rain, shine or hungover. Among other dedicated female runners in the *MC* runners are Veronica, Mellissa an Mary. Do you love running early in the dark cold morning? Do you need to compete or qualify for Boston? Do you have fun under great pressure? Are you eager for hard run? Do you dare to test yourself in 400s,800s & mile intervals? Are you willing to wake up @ 4:00 ish? Do you know how to run fast around foul- smelling skunks? Can you measure up to what the coaches demand? Coach Roberto *Kadafi* Perez - Speed and Strength & Coach Ismael Favela, Distance and Endurace. Snow in the mountains. Deer spotted going up Lopez Canyon. Sunny finish. This is a tough run that combines long stretches of hilly road running, with a monster trail climb starting at mile 10. Little Tujunga Canyon, Lopez Canyon, Mysterious Mt.